With the ubiquity of e-mail comes the increased risk that corporate e-mail systems will be used for fraud. However, only the individual sending and receiving the messages knows the underlying meaning, and message flow occurs whether the intent is for the benefit, or contrary to, a company’s interest. As a result, tools designed to monitor message flow for production and troubleshooting in an Exchange environment may also be applied to a forensic examination. This article discusses the use of one such tool, Microsoft’s LogParser utility, for conducting investigations of unacceptable communications. At least as far back as Exchange 5.5, message logging was available, but not enabled by default on versions earlier than Exchange 2007. The message tracking features of Exchange create logs or records detailing message activity in an Exchange organization. In order to save space, the message tracking feature uses ‘‘circular logging.’’ Circular logging refers to the process by which older logs are overwritten by newer ones after a specified period of time. Generically, a message is an instance of data exchanged between running processes. It follows then, that the tracking of messages can be defined as ‘‘logging,’’ determining how and where such exchanges occurred and recording the messaging transactions for examination. The information tracked and logged varies from process to process. The logging of data exchanges between processes is for the most part unknown to users, but in fact, records verification that the remote process has received the data or communication of other information that is necessary for the business processes to function properly. System administrators use message tracking for such things as troubleshooting, reviewing historic transactions, data mining, or performance evaluations. The forensic examiner can use this same information to determine what type of communication occurred and when (within the logging period). It is the ability to mine or evaluate message activity which lends itself to a forensic examination of transactions. With respect to Exchange, the instances of data being tracked are electronic mail messages sent, received, and processed by the Exchange server. The date and time of the message event. 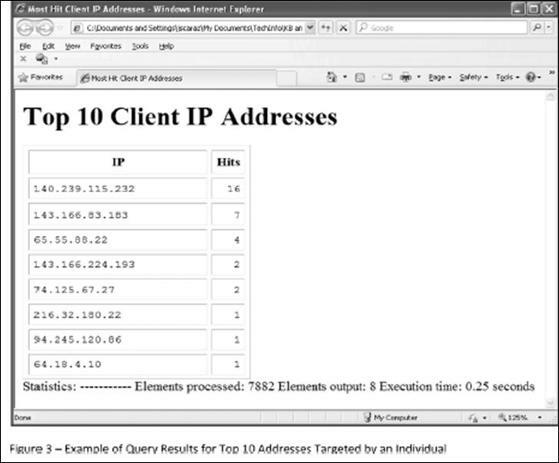 The IP address of the messaging server or client that submitted the message. 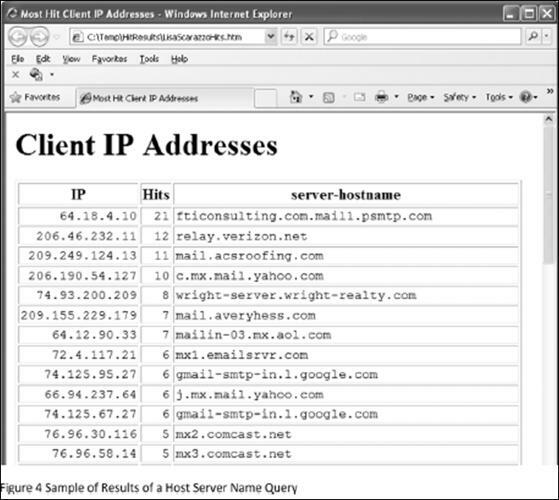 The IP address of the source or destination server running Microsoft Exchange. An internal message identifier assigned by the Exchange server processing the message. A message ID found in the message header. The number of recipients receiving the message. The message metadata is recorded in the tracking logs and persists until the log is overwritten, even if the actual e-mail message itself has been deleted, removed from the deleted items folder, and subsequently cleared from the Exchange Dumpster. (The Dumpster functions somewhat like the better-known Recycle Bin, and is described more fully below.) By default the logging period is 30 days but an administrator may set the period to a length of time more suited to specific business needs. Acceptable logging periods currently range from zero to 24,855 days. 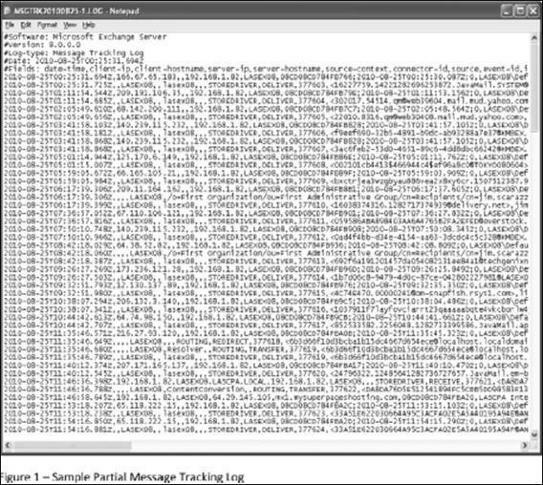 While message tracking is intended for an Exchange administrator’s use for such things as collecting information about message flow, or gathering statistical information such as the number of messages sent or received, the message metadata contained in the logs can also be mined for forensic examination purposes. Consider a scenario where suspicion arises that an individual or group of individuals is transmitting proprietary information to a competitor or an employee is e-mailing company information to a personal e-mail account. There are numerous instances where knowledge of what messages are being sent or received and when they are being sent or received, regardless of message content, might be of value. A need may arise, for example, to know the top 10 persons with whom an individual communicates, as a basis for discerning which other employees or individuals are involved with an event. Examination of message tracking logs might provide or supplement information relevant to such questions. Questions relative to subject content or dates and times of communications might be of interest. Tracking log message metadata might also provide insight into correspondence being sent from an employee to a competitor. Reviewing the metadata information captured by the tracking logs can identify valuable information about message traffic for further examination. whether the person of interest utilized the company’s Exchange server as the means of communication. Nevertheless, examination of message tracking logs should not be overlooked as a potential source of information. The logging process documents information being sent or received by an Exchange server. In a large organization with multiple Exchange servers, it might be necessary to collect the logs from all of the servers in order to fully understand the message flow. If the Exchange server being examined is configured with Exchange 2003, message logging is disabled by default. To conduct the desired examination, message logging must be enabled on the Exchange server. In an Exchange 2007 and Exchange 2010 environment, message tracking is enabled by default on servers having the Edge Transport, Hub Transport, or Mailbox roles installed. It is important to understand the Exchange configuration before proceeding. The examiner must also take precautions to document the validity of the copied logs and record the chain of custody for the electronic evidence. Consequently, the first step in the process is to determine if logging was enabled on the Exchange server(s) on which the mailbox(es) of interest is (are) stored. Once a determination is made to collect the logs they may be copied from their location on the servers to external media. The log files should be hashed for evidentiary purposes, and a record of the collection should be made. For Exchange 2007: C:\Program Files\Microsoft\Exchange Server\TransportRoles\ Logs\MessageTracking. In a forensic investigation, it is likely that the transaction logs will be copied from the Exchange server for examination, rather than conducting the review on a live system. Such being the case, a UNC path or a local path designation must be used to identify where the logs are located in order to use LogParser to run queries against the logs. If the local path contains spaces in the path name, the entire path must be delimited by single quotes. This path information will be utilized in the FROM parameter of the search query. If a local path is used, it is best to place the log files in a folder to which there are no spaces in the path name. LogParser utilizes a SQL engine to query the log files and therefore has considerable power to return information about the tracking log contents. Some of the more common queries include messages sent and/or received by an individual, messages sent or/received by a particular domain, and messages containing certain key words in the subject line. It may also be of interest to determine the top number of messages communicated to or from certain persons. LogParser provides the examiner with control of the output format and permits the use of templates to create, among other things, an html report. Figure 1, Message Tracking Log4, shows a typical log file opened in its raw state—an almost continuous stream of comma separated values. Formats. Exchange 2003 Exchange logs used the W3C format. However, there is not a specific format for Exchange 2007 and Exchange 2010 logs so one must use CSV as the input format. The LogParser utility accepts both formats. LogParser also provides control of output formats. A practical output format is HTM. 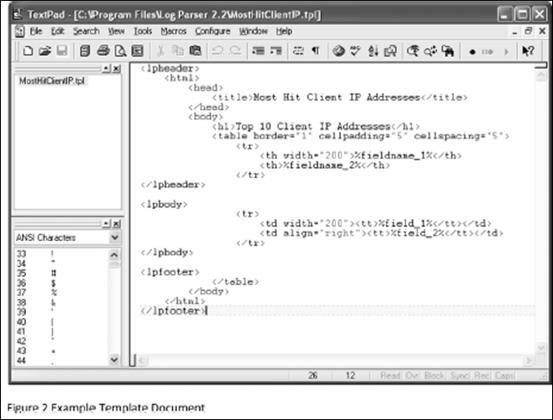 HTM files are written as defined by a template file. Any message flow examination, whether conducted for forensic or Exchange administrative purposes, is done to determine how, when, and to what extent communications occurred. Such queries might include determining the most frequent communications, if a particular individual was sending or receiving messages from an outside third party, if messages were sent containing a subject of interest, or examination for a number of other criteria. Since the log files persist for the specified logging period even if the messages themselves are purged, examination of the logs might provide evidence of communication when searching for the messages themselves does not. The Exchange server has a feature referred to as ‘‘the Dumpster.’’ This feature retains messages for a set period of time (after a user removes them from the deleted items folder) to allow for recovery of deleted items, much as the recycle bin on a computer holds information until it emptied. By default, messages are retained in the dumpster for seven days, after which they are purged from the Exchange database. On the other hand, also by default, the Exchange tracking logs are maintained for a period of 30 days. Therefore, it may be possible to discover evidence of communication by examining the tracking logs for several weeks after the actual message has been deleted from a user’s mailbox and subsequently purged from the Exchange dumpster. Examination of the tracking logs might also provide for a preliminary assessment before a more detailed review is undertaken. Likewise, inspection of the tracking logs may supplement and support the actual e-mail message review. 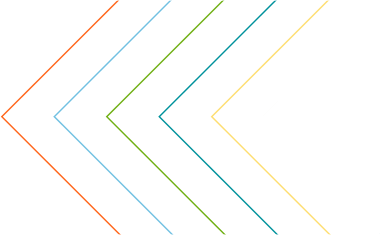 LogParser is a command line tool and can be installed on any Windows based machine. As noted above, the log files can be copied from the Exchange server to external media and examined outside of the Exchange environment. This provides for considerable flexibility. The syntax of this query requests the top 10 addresses targeted by ‘‘<Sender Address>’’, counts the numbers of hits or times messages were sent, and exports the results to an HTM document named MostHits. htm. <Path> is the UNC or local path to where the logs are stored. Figure 3 shows the results of such a query. The value of this examination is: it provides a documented method to determine if communications occurred between a given individual and outside sources, and identifies the frequency at which those communications occurred. The use of the Source-SMTP parameter signifies communications outside the company network. Internal communications could be evaluated by changing the source STOREDRIVER. While this example was run on a small data set for demonstration purposes, the process is the same regardless of number of transactions recorded in the log files. This assessment might be conducted on several individuals and a target server IP address where the results are collated and reviewed for commonality and frequency. The results of such an examination might also provide some insight into a social network. 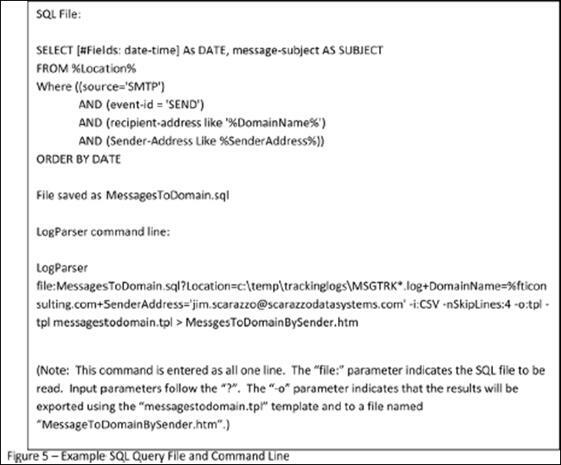 The query might be modified to target specific recipients as well as document if and how often communication occurred between individuals during the logging period. A slight modification, changing event-id = ‘Receive’ and sender-address to recipient-address would produce results of external communications delivered to a specific company employee. Figure 4 shows the results of this query exported to HTM format. Resolution of a particular server name is more readable by humans and provides easy insight into where communications were being sent. Again, a combination of queries might be run to examine commonalities with respect to communications. All of the fields in the tracking logs can be queried depending on need. In addition to the queries outlined above, LogParser can be used to examine the logs for such things as subject keywords, dates of messages, events, or the source of the message. The results of the queries can be viewed on-line in the command prompt or exported to various formats for additional review. Situations requiring examination for multiple parties might require the use of a batch file, exporting the results to individual HTM reports. LogParser query results can be exported to CSV file format, which might subsequently be imported to a database application for examination. LogParser allows for the import of query files so that complicated queries might be saved and certain parameters read in as variables. By creating SQL files, the examiner can be assured of reproducible results. Figure 5 provides an example of a SQL file and the associate LogParser command line. The SQL file is called from the LogParser command using the ‘‘file:’’ parameter. In conclusion, LogParser is a powerful command line tool with considerable flexibility, permitting extensive examination of Exchange tracking logs for a number of items of interest and allows for the export of that information in multiple formats. 4 All figures were created specifically for this article on a set of test data developed for illustrative purposes and do not represent any specific source or target any specific incident. They are intended purely to illustrative the points being discussed. Any association or identification of actual names or IP addresses is coincidental. Jim Scarazzo is a Director in the Technology practice of FTI, specializing in computer forensics. Mr. Scarazzo has extensive experience in computer systems, hardware, networks, and has performed numerous acquisitions and forensic analyses. Mr. Scarazzo has also provided testimony in matters involving electronic evidence and computer forensic examinations. The views expressed in the article are held by the author and are not necessarily representative of FTI Consulting, Inc. or its other professionals. The information contained herein is of a general nature and is not intended to address the circumstances of any particular individual, entity or transaction. No one should act on such information without appropriate professional advice after a thorough examination of the particular situation.